Fallon St. James is the farthest thing from perfectly anything. As head of the secretive Spare Heirs Society, he must stick to the shadows...even as Isabelle's friendship pulls him reluctantly into the light. But when Isabelle gets involved with the one man who could destroy Spares, Fallon must decide between protecting his life's work—or risking everything to save the woman whose warm smile leaves him breathless. I continue to be impressed by the richness and depth of the stories within Elizabeth Michels' Spare Heirs Society, historical romance series. 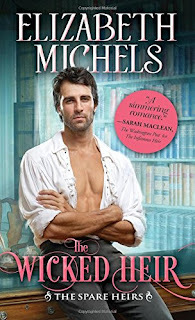 In The Wicked Heir, Michels turns her sights on Fallon St. James, the mysterious leader of the Spare Heirs, and Lady Isabelle Fairlyn, who readers may recall as a secondary character from previous books. At the start, the two seem an unlikely match. He is a tightly controlled man who eats, sleeps, and breathes the business of the Spare Heirs while Isabelle dances her way through life in a cloud of fairy dust, or so it seems. I fell for Fallon in a heartbeat - Isabelle took a little more getting used to - but, together, they captured my heart as all of Michels' couples have done. Ms. Michels is adept at weaving emotional complexity and suspense through her books while also bringing readers a deeply romantic tale, lightened by strategic splashes of humor. It's a fine balance and one she carries off with panache. Balance is a good theme for this particular book as that is something that seems to be lacking in Fallon's and Isabelle's lives, particularly Fallon. I love how Isabelle, with her sunny, positive outlook on life, gradually introduces touches of light into the dark corners of his life. The scene where he's introduced to the food his cook prefers to prepare is a particular favorite. Fallon is an honorable man, loyal to his friends and determined to protect those unable to protect themselves, such as Isabelle after she's attacked by an enemy, but he has an iron-grip control on himself, a reluctance to ask others for help, and many more layers than I had guessed. With each layer unveiled, he wound his way more tightly around my heart. Isabelle may seem immature at times and lost in her self-imposed fairytale outlook on life but as the story slowly unfolds, I could see her insistence on a rainbows and unicorns existence for the coping mechanism it was and I appreciated her evolution as she began to accept the realities of life around her. She needed to grow up to be an equal partner in her relationship with Fallon, which she does, and I'm delighted she was able to do so without losing that goodness and positivity that are such essential parts of her. Michels once again surrounds the main couple with a vibrant secondary cast, including a truly nasty villain who is chillingly written. Heroes and heroines from previous books in this series, and the one past, pop in and out of the story on occasion, adding spice to the soup without detracting from the main dish. Two secondary characters who have vital roles in The Wicked Heir are Isabelle's twin, Lady Victoria Fairlyn (Isabelle's opposite in most every way) and Fallon's best friend, and fellow Spare Heir, Lord Hardaway. Those two are like a powder keg waiting for a lit match. I can't wait to see what Michels has in store for them! Oh, another historical for my tbb pile - thanks. I read a previous book in this series, and like you, I liked it very muc. Ms Michels does a bang up job of holding my interest. Thanks for the review. Elizabeth's books are really good. I look forward to reading this.